Unless you’ve been cut off from civilization for a few months, you’ve likely heard that KitchenAid has released a revolutionary addition to its lineup of the best kitchen mixers in 2016. Our review of the KitchenAid Artisan Mini stand mixer will entertain you, educate you, and may even convince you to purchase an Artisan Mini mixer for your kitchen. We make it fun, share some interesting facts about this new mixer, and hopefully give you everything you need to decide if this is the best stand mixer for your kitchen! You know how it feels when you get a new appliance or tool or device, of whatever kind, be it a Bernina® sewing machine, a Dewalt® cordless drill driver, or an Apple® iPad? Like you’re in heaven. Finally. And, yet still, you don’t know what took so long to get there, and you wonder how you survived on earth as long as you did without this incredible dream machine. The first home stand mixer was a 10 quart machine with a model number, C-10, which was then followed by the H-5, housing a 5 quart bowl introduced in 1922. A similar mixer to the H-5, but lighter in weight, was introduced as the “G” model in 1928, and year after year, retailers would sell out of KitchenAid® mixers every Christmas. It was in the year 1930 when Egmont Arens was hired to design a model that cost less to make and was more streamlined in its overall features. Thus was born the “Model K” and since that time, the KitchenAid® stand mixers as we know them today have remained relatively unchanged. In fact, most interesting is that ever since the introduction of the Model K, the parts of all KitchenAid® stand mixers, even those dating back to the 30’s and 40’s, are essentially interchangeable even with today’s machines. Eventually the very consistent and highly recognizable silhouette was made a registered trademark with the U.S. Patent and Trademark Office, and later, in 1997, the KitchenAid® stand mixer was deemed a classic American icon by the San Francisco Museum of Modern Art. During WWII the Springfield, Ohio Hobart Toy Factory where the best KitchenAid® mixers were manufactured closed its doors, however a new factory in Greenville, Ohio began operations after the war in 1946. As the decades rolled on, celebrity chefs such as Julia Child and Martha Stewart made ample and public use of their KitchenAid® stand mixers, and retailers such as Williams-Sonoma, Target, Kohl’s, and Macy’s have effectively encouraged the KitchenAid® company to expand the available color scheme options beyond their classic “cobalt blue” model. Today, you can have an entire a rainbow of KitchenAid® mixers. The thing about the KitchenAid® brand is that they are committed to just that: Aiding you in the kitchen. And from that standpoint they have never faltered. The company’s motto is “Created for cooks who love to cook!” And as far as we are concerned, it’s true. KitchenAid® is now a household name, their products always carry high consumer ratings, and you know that they have a long history of the business they’ve been in, and in the business they will likely stay in. Their attention to detail, superior craftsmanship, fluid technology, and enduring designs have remained consistent, and their sales have continued to increase year after year. Basically, the bottom line in reading this Artisan Mini review is you just can’t go wrong with a KitchenAid®. The new Artisan® Mini KitchenAid® Mixer we researched is definitely a “junior” version of its predecessor, although, make no mistake, the features of power and versatility are still fully intact. While the “Mini” still retains is tilt-head maneuverability, and the classic styling of the standard and professional models of the KitchenAid® stand mixer, this model is 25% lighter in weight and 20% smaller in overall size. What was not scaled down in the “Mini,” however, was the most important element. The POWER. With a healthy 250 watts of power, just like the larger Classic models, you can still be confident when beating stiff cookie or bread doughs. With most things we tend to think that smaller means weaker, but consider computers for a minute. Back in the day when a computer was in its infancy, one motherboard and hard drive took up the area of an entire building, or an entire room, whereas now, the might of an entire computer and all it can do will literally fit in the palm of your hand. So, bigger isn’t always better, and we are here to tell you that this combination of small AND mighty that can be found in the Artisan® Mini KitchenAid® mixers is a welcomed addition to mixer options. With the “Mini” it is true that the mixing bowl that goes with the model is also smaller than the standard models. While the standard-sized models typically use a 4.5 to 5 quart bowl, the “Mini” uses a 3.5 quart bowl. But here again, while you have less acreage that might keep you from making 9 dozen cookies or 7 pounds of mashed potatoes, do you really need to make that volume of anything these days? With families being smaller, as time goes on, and with people eating less (on average) in order to improve health and wellness, it seems that a 3.5 quart bowl that can easily accommodate the dough required for up to 5 dozen cookies is more than adequate. In fact it might be just perfect! Okay, so that one weekend a year that you want to make 20 dozen cookies, you’ll have to make 4 different batches instead of just 2. But, by this time, you’re a whiz at churning out cookies, and you might even welcome the excuse for cutting back on your holiday baking because you’ve downsized! That’s called taking some of the pressure off! And even if you do want to make every sweet and savory item conceivable with your Artisan® Mini KitchenAid® mixer, the likelihood that you need to feed an army, or prepare for Armageddon, is pretty slim. Think of it this way: The “Mini” mixer allows you to get back to the days when food was prepared in smaller batches, with love and by hand (with “the best kitchen aid you’ve ever known,” of course) and it allows you to really enjoy the process of working with a piece of equipment that does the job, but doesn’t require the strength of a hulk to do the work. One of many reasons that this high-powered yet smaller machine is so desirable is that it takes up way less real estate on you kitchen counter. Despite the changes and upgrades over the decades of home-kitchen design, just about every cook we know could ALWAYS use more counter space. Why is it that garages keep getting bigger, exponentially, but as far as kitchens go, cooks have only gained a few extra feet over the years? It’s so unfair! If you are a cook who uses your kitchen mixer regularly, and therefore it has a permanent spot on your counter for easy access, then having a small-sized stand mixer (12.3″ long x 7.8″ wide x 12.3″ high) is advantageous because it is less noticeable, it fits under lower than normal cabinetry, and you have more free counter space to do all the other tasks required of a home cook or baker. Heck, you might even have room for your cup of coffee, with a pretty coaster underneath it to boot! Now, for those of you who are either limited on free counter space, or who prefer to have your all appliances tucked away in cupboards, except when in use, the fact that the “Mini” is lighter in weight will definitely take away the flash of dread you feel in your veins when your family asks for that home-made herb-onion bread you are famous for that goes so well with tonight’s upcoming dinner of corn chowder. Hauling around, lifting, or lowering, a standard model of the KitchenAid® mixer is no easy task, so for anyone who’d rather climb mountains that hoist mixers, the “Mini” is the mixer for you which really is the theme of this KitchenAid Artisan Mini review right? The Artisan® “Mini” is described as weighing 14.3 pounds as opposed to the hefty 26 pounds of the more standard models. As far as we know, the gym is the place to build your biceps, not your kitchen! Many KitchenAid® stand mixer models, including professional ones, are stationary in the sense that their “power hub” (the bullet shaped top to your mixer that houses the motor) stays in one place. There is a lifting lever on the side of the mixer that allows you to raise and lower the bowl. While this design might be suitable enough for very experienced cooks and bakers, who over the years have gotten quite used to removing a mixing attachment (a beater, dough hook, or wire whip) BEFORE removing the bowl, it’s a bit annoying. But with a tilt-head power hub, as is featured on the “Mini” you have clear access to the bowl (so long as you stop the beater and lift the power hub) so you can easily add ingredients for a recipe, or you can change mixing attachments if necessary, or you can effortlessly remove, or change out the bowl. The tilt head does have a locking mechanism, which when engaged, during the machine’s operation, keeps the beater-to-bowl contact close and efficient. The tilt-head feature, to many “old-fashioned bakers” borders on being an extravagant extra, because anything that actually makes a job easier is like getting a birthday present on the 4th of July, however we believe that with the “Mini” you can work smarter and not harder, and that is a very good thing! Most of us remember, or at least we’ve heard about when certain things only came in one color. Cobalt blue is often associated with the most well-known KitchenAid® stand mixers, just like when Apple® iPods first came out they were mostly all white. And remember when you could suddenly get mini-iPods in a ton of colors? Wow! Party time! Certainly even the standard and Artisan® KitchenAid models have been offering their machines in as many as 20 different colors for years, however, we are excited to know that at the time of introduction, the “Minis” are available in at least 10 colors that include Honeydew, Matte Gray, Guava Glaze, White, Black, Empire Red and several more. In today’s world, with the trend back to cooking and eating at home, the kitchen is returning to the hub-status of a home, and with much so time spent in the kitchen, you want it to look good and be an attractive place that invites you to be there. With having so many color options available when choosing your new “Mini” mixer, you can really let your creative juices flow and get a little crazy with your kitchen decor. If you like a very sleek and modern style then the Matte Gray would be the perfect color mixer for you, however if you just love greens, and the Honeydew color makes you feel “at home” and stirs up your urge to bake or cook, then by all means step outside of convention and get yourself a green “Mini” mixer! It might just be the central topic of discussion the next time you have guests over for dinner! 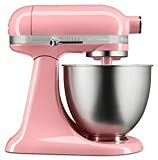 If a pink mixer is your deal, well, KitchenAid® had you on their mind when they included the Guava Glaze hue in their color palette for the new “Minis.” Granted, you might not see the male members of your household touching the thing, but you’ll feel wonderful in all of your feminine glory….and perhaps that was your goal to begin with: To Keep People’s Hands OFF Your Dream Machine! No matter what color you end up choosing, you can be assured that the enamel paint on your Artisan® Mini KitchenAid® stand mixer has been thoroughly user-tested and is absolutely cleanable, durable, and beautiful. Resistant to peeling, scratching, or rusting, your colorful “Mini” mixer promises to keep looking fine over time. The “Mini” mixer, as with every KitchenAid® stand mixer model comes equipped, upon purchase, a Soft Start® 10-Speed lever, a brushed stainless steel 3.5 quart bowl (with no handle, by the way), and 3 attachments: An enamel-coated beater blade, an enamel-coated dough hook, and a stainless steel wire whip. These are the three most commonly needed and used attachments, however, the “Mini” like all KitchenAid® mixers is able to accommodate as many as 12 different “other” attachments. The extra attachments include useful tools such as a spiralizer, a pasta roller, pasta cutter sets, pasta extrusion sets, a citrus juicer, a food processor with a cutting blade set, a food grinder and sausage stuffer, and many, many more. It is because of the basic design and power of “the hub” that the “Mini” model mixer is virtually the same as the hub of all other KitchenAid® stand mixers you may have reviewed in the past. And in addition, the numerous and diverse “attachments” are known to be useful and functional, and are virtually interchangeable between models of all variations and years. The ability to use the attachments, turns your “Mini” mixer (typically devoted to bread doughs, cake batters, and cookie doughs) into what KitchenAid® calls a “culinary center.” By purchasing, and having, and using the attachments that go with your “Mini” you can actually streamline your cooking and baking activities, and have fewer pieces of equipment on your countertop. We’ve already talked about how valuable free and open counter space is, so with that in mind, the possibility of having a near all-in-one machine is pretty dang earth-shaking! Furthermore, all of the attachments slip in and slip out (when not in use) of the mixer’s power hub, are all dishwasher-safe, and all are easily stored in a drawer or pantry. Imagine being able to make your coffee cake for breakfast, your pasta for dinner, your spiraled vegetable medley as a side dish, and your brownies for dessert, all on one machine! And then, for clean-up you can have your dishwasher clean the bowl(s) along with the various attachments you used. Then, with a quick wipe down, your Artisan® Mini KitchenAid® mixer looks as good as new! It really doesn’t get much better or easier than that! We’ve discussed at length the many virtues of the size and weight of the small but mighty “Artisan Mini”, but mostly in the context of having your machine at home. Consider this: What if you have a motor home, or what if you are going away for a weekend at a cabin, and you really want to be able to do some baking? Since you’ll be baking and cooking, we are pretty sure there will be no contest to your declaration, but at least, the mixer will go bye-bye with the family and it WILL get used. This is, of course, assuming you don’t already have two, or even three “Mini” mixers for everywhere you go. For some fun photos of how people are using the new Artisan Mini mixer check out this KitchenAid site for the mini mixer! As we know, motor homes require very careful planning when it comes to furnishing them, and so forth….but just think of perhaps having a “Mini” mixer just for your travels that you can leave in the motor home when you get back to town? As we all know, mobile devices of any sort are all the rage, and now, your “Mini” mixer can be your favorite mobile appliance! And yet another aspect of mobility, with regard to the “Artisan Mini” mixer is that it’s great for furnishing your child’s kitchenette in their first year of college, or for shipping to your best friend, who’s never owned a KitchenAid® mixer in their lifetime. How cool would it be to receive a “Mini” as a very special birthday or Christmas gift? Again, thanks to the fact that the “Mini” does not take up a lot of space, or weigh very much, there is currently a wider audience of wannabe cooks and bakers who can now get addicted to their KitchenAid® stand mixer much earlier in life. The good part is that, unlike smoking, this addiction might just save you some bucks, make you some life-long, adoring friends, and keep you healthy! Everyone pretty much knows that a KitchenAid® mixer is a commitment, and is an investment. Otherwise why would you be searching for and reading mixer reviews like this one? But really, compared to televisions, laptops, cellphone plans, and trips to Vegas, we can assure you that the money you’ll spend, and the return on your dollar you’ll get, from purchasing a KitchenAid stand mixer, is hands-down a good financial decision. In other words, where are the savings? This is a very good question, and yet the answer is fairly simple: Desirability, Usefulness, and Demand. Even though the “Mini” is smaller in stature, we’ve already mentioned that the wattage (of the power hub) is the same as the larger models of KitchenAid® stand mixers. Though small, the “Mini” packs a punch and can take on (productivity wise) just about whatever else is available on the market. You know how it often takes almost as much time and energy to make one batch of cookies as it does a double batch? Well, the same applies here. Yes, the overall appliance may be smaller, but for all intents and purposes, the same efforts and costs are incurred in order for KitchenAid® to manufacture the high-quality, durable, and versatile machine that we’ve all come to know and love. KitchenAid® is an American company, and their products are American made, and with a product like the “Mini” it’s going to be awhile before a new model can top it. After all, these stand mixers are built to last, and indeed they do. We guarantee your KitchenAid® mixer will far outlive your travels to Belize and your Samsung® phone! We don’t know about you, but for us, the Artisan® Mini KitchenAid® Stand Mixer is just plain cute, no matter what color it comes in. Okay, so the black one is a little sleeker, and the white one screams, “I’m a clean, mean, mixing machine!” But, overall, the “Mini” makes people go all soft and gushy and say, “Awwww, just LOOK at that CUTE mixer!” Kinda like puppies and kittens….you just can’t get them out of your head, and you just have to reach out and pet them. Please, try to restrain yourself while shopping at an upscale store, but then again, it’s quite likely the retail staff have seen the same reaction countless times before. And we all know what happens when we see something soooo cute? It comes home with us, and while we are on our way home we are coming up with an explanation for our family as to why we have this new puppy, kitten, or mixer. Yes, even the most discerning cook or baker can fall prey to cuteness, but really, it’s a win-win situation, because unlike puppies and kittens, the “Mini” will STAY cute, forevermore, and it will be useful, too. In all honesty, our review of the KitchenAid Artisan Mini mixer results in us really not having any reason why you wouldn’t or shouldn’t purchase and own this fantastic stand mixer. Is it the best KitchenAid mixer ever? Only time will tell. If finances are tight, then just as with anything else you really would like to own, you’ll have to save up. At least with a “Mini” mixer it will be the gift you give to yourself, or someone else, that literally keeps on giving. Once you own it, and perhaps spend a little more on all the attachments you want to make use of, you won’t have hidden fees, or monthly line-access charges like you do with cellphones! What you buy is what you get, and with just about any KitchenAid® product, there’s very little that will go wrong, and very few elements that will break. It will be years before the new Artisan Mini shows up in as many kitchens as the KitchenAid Classic or normal Artisan. If this review of the KitchenAid Artisan Mini mixer has got you excited, you should be. You will have a unique addition to your kitchen that may make your neighbors mixers look, well, a bit old fashioned in comparison!